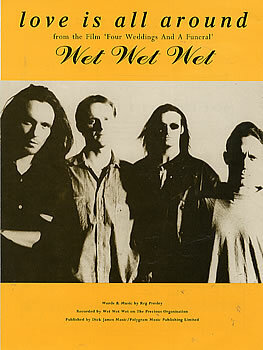 Wet Wet Wet’s version of “Love Is All Around” was released on May 9, 1994. It topped the UK singles chart after two weeks and, fueled by its appearance in the movie “Four Weddings and a Funeral“, remained there for fifteen consecutive weeks. All told, the song spent 37 weeks on the Top 75 survey. “We did everybody’s head in in the summer of 1994,” commented the band’s frontman, Marti Pellow, exactly a decade later. This led to some radio stations banning the song. The band themselves eventually took the decision to delete the record from sale.